Important Notice: Translation / wording may vary. Items herein may be partial. We may change punctuation, capitalization, shorten items, etc. We make no guarantee regarding any item herein. By using this site you indicate agreement to all terms. For terms information, click here. How is One Made a Saint? "The Acts of the Saints" (Lives of the Saints, published by the Bollandists) - A multi volume set created over hundreds of years. According to the Catholic Encyclopedia, "This monumental work has become the foundation of all investigation in hagiography and legend." Traditionally, every Catholic church had a consecrated altar which contained relics (corresponding to the early practice of celebrating Mass on the tombs of martyrs) and which had a title ("titulus") - usually corresponding to the name of the church (except side altars). Usually refers to the twelve men chosen by our Lord (click here) and headed by St. Peter, and also to St. Paul and to St. Matthias (who replaced Judas). However, this term may also refer and to others in the early Church and to missionaries (e.g. St. Patrick is called "the apostle of Ireland"). Note that not all apostles are saints [e.g. Judas, who was lost (see Jn. 17:12: "...none of them was lost except the son of destruction, in order that the scripture might be fulfilled", Mt. 26:24 & Mk. 14:21: "...woe to that man by whom the Son of Man is betrayed. It would be better for that man if he had never been born.")]. Today's bishops are the successors to the apostles, and the Pope is the successor to St. Peter. "Beatification is the process by which enquiry is made into the sanctity of a deceased person and, upon proof thereof, permission accorded for his public veneration; this is usually limited to a particular country, diocese, or religious order and does not extend, without special permission, to the display of his image in church or to a Mass and Office in his honour. Beatification generally, but not necessarily, leads to canonization" (Catholic Dictionary). Note that once an individual has been beatified, he or she is referred to as "Blessed" (abbreviated "Bl."). Also note that some beatifications are referred to as "virtual beatifications" (e.g. certain cases which deal with "immemorial public veneration" of a particular person). Commonly called "lives of saints", these accounts of the saints' lives are interesting and inspiring stories which have long been recommend spiritual reading. The quality and readability of accounts may vary widely. Some accounts are critical, while others are uncritical collections (some of which may have suffered some embellishment over time). They provide good examples for Catholics and also provide important historical information. Although various details of some accounts may be based on myths or legends, one should not automatically assume that every event that seems unbelievable is not true (remember that nothing is impossible for God). One should also note that the term 'legend' may previously have included items that were not fictional. Well-known "lives of the saints" include the Acta Sanctorum (click here), Butler's Lives of the Saints (click here), and the Golden Legend (click here). Refers to those who have been beatified (click here). A "monument of work and research" (Catholic Encyclopedia), this popular four volume set created by created by Alban Butler (d. 1773) took nearly 30 years to complete and was the "great work of his life". The collection is considered "monumental" and may be considered "one of the most revered books after the Bible". Butler's "Lives of the Fathers, Martyrs, and Other Principal Saints" contains numerous biographies of various saints, organized by date. This arrangement by date makes the work well-suited for daily spiritual reading. Note: In recent years, at least one updated edition of this work has been released, still bearing the name "Butler". Newer versions have been charged with "destroying much of the beauty" of the original work. Note: Older editions (e.g. "pre-Thurston") may still be available. Contact an appropriate Catholic bookseller. In the wake of the Second Vatican Council, many changes were made to the liturgical calendar, including the elimination of numerous universal feasts (including highly popular feasts, feasts of popes, etc.). The old calendar is still in use, however, by traditional orders and in places where Masses are celebrated according to the old ('Tridentine') rite. For the location of such Masses, contact your bishop. For more information about the glorious traditional Latin ('Tridentine') Mass, click here. For feasts of the old and new calendar, try here. Refers to the liturgical calendar in which each day of the liturgical year may be associated with one or more saint's feasts (and other holidays). In addition to the universal calendar (the "General Roman Calendar"), there may be various local calendars, especially in the earlier years of the Church. Note that the various calendars have grown and changed over the years, including drastic changes to the Roman Calendar in the wake of the Second Vatican Council (click here). Also note that not all feast days appear on the General Calendar. For liturgical feast days, try here. For feast days from the Roman Martyrology, try here. "A public and official declaration of the heroic virtue of a person and the inclusion of his or her name in the canon (roll or register) of the saints." (Catholic Dictionary) This declaration is reserved to the pope and occurs after beatification (but not for all those beatified). Formal canonization may take centuries and may require miracles as heavenly testimony. Canonization obliges that public honor be given the saint. Note that canonization does not "make" one a saint, but declares one to be a saint. Also note that not all saints are canonized (in fact some great saints were never formally canonized). In the past, the formal declaration - which occurs only after a strict, extensive investigation - has generally been considered to be infallible and irreversible. 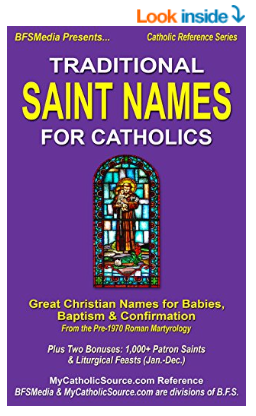 Although the veneration of saints traces from the earliest days of the Church, the process for naming particular individuals as saints has seen variation over the years. At first, 'canonizations' were informal. This practice, unfortunately, was sometimes subject to abuse. Later, certain matters were handled by the bishop. Eventually, a formal process was instituted, reserving much of the process to Rome. As stated by the Catholic Encyclopedia: "It must be obvious, however, that while private moral certainty of their sanctity and possession of heavenly glory may suffice for private veneration of the saints, it cannot suffice for public and common acts of that kind. No member of a social body may, independently of its authority, perform an act proper to that body. It follows naturally that for the public veneration of the saints the ecclesiastical authority of the pastors and rulers of the Church was constantly required. The Church had at heart, indeed, the honour of the martyrs, but she did not therefore grant liturgical honours indiscriminately to all those who had died for the Faith." (Catholic Encyclopedia) In recent years, under Pope John Paul II, the formal process has undergone extensive change (see above or click here), but the formal declaration of canonization still remains reserved to the pope. "The preliminary enquiry and subsequent processes of beatification and canonization. A cause opens with an ordinary process under the bishop's jurisdiction in order to determine whether a sufficient case can be presented to the Roman authority" (Catholic Dictionary) During the process, there are various steps (e.g. an enquiry into the sanctity of the deceased person, examination of his or her writings, etc. ), possibly leading to the beatification (click here) and, ultimately, canonization (click here) of the person. Although Catholic churches are always dedicated to God alone, they are often dedicated to God in honor of a saint. The particular saint's name may be chosen due to possession of the saint's relics, special devotion to the saint by the founder of the church, the saint's labors in the area, etc. This practice may be traced back to the earliest days of Christianity, where Masses were said on the tombs of saints. The saints really are "our friends in heaven". They do not cease to have charity for us because they are in heaven, rather they are "bound to us by love". In fact, if anything, they are even more willing and able to help us now that they are "before the throne of eternal Goodness". Not only do they want to help us, but they are close to God and have influence with Him. God enables them to hear our prayers and their intercession has been felt by countless people, even in the most extraordinary ways. Of course they are not gods and have no power of their own, but all is done through Christ. Clearly, the saints are alive, and before God. They care for us, they understand us, they have faced trials, they want our good, and they can be trusted. History is an unfailing witness that they really, truly do aid us. Be sure to regularly ask for their intercession. May refer to those who suffered for the faith or to certain saints who were not martyrs. When saints share a patronage, they may be called co-patrons - for example: Sts. Cyril & Methodius (brothers) are co-patrons of Europe. Ancient Roman calendar containing the feasts of the martyrs. Note that the "devil's advocate" might argue that miracles are fraudulent, he might question various motives, he might look for "holes in evidence", etc. In general, his actions helped secure the integrity of the canonization process. Note: The "Devil's Advocate" was eliminated under Pope John Paul II (click here for more information). "Devotions, popular, are spontaneous pious movements of the Christian body towards this or that aspect of the faith, sanctified individual or historical event, approved by authority and usually expressed in authorized vernacular formulas and observances. They are very numerous" (Catholic Dictionary). Devotion to the Saints may include: chaplets, prayers, novenas, medals, statues, etc. Note: Click here for prayers to the saints, click here for information on devotions/sacramentals. Click here for a list of the Doctors of the Church. * The "four Doctors" of the Western Church are St. Gregory the Great, St. Ambrose, St. Augustine, and St. Jerome while the "four doctors" of the Eastern Church are St. John Chrysostom, St. Basil, and St. Gregory Nazianzen, and St. Athanasius. Note that this refers to those with early pre-eminence. A particular image associated with a person in a pictorial representation. For example: a lily for St. Joseph, a cross for St. Helena, a dove for St. Gregory, etc. Note that one saint may have various emblems and that many saints may share one emblem (e.g. a palm for martyrs). Emblems may relate to an event in the saint's life, to a certain characteristic of the saint, etc. The examples of the saints inspire us, help "form us in virtue", and are "living images of the Gospel". Written account of their lives, biographies called "Lives of the Saints" (click here), have been widely praised as excellent, profitable spiritual reading. "Feast Days, or Holy Days, are days which are celebrated in commemoration of the sacred mysteries and events recorded in the history of our redemption, in memory of the Virgin Mother of Christ, or of His apostles, martyrs, and saints, by special services and rest from work. A feast not only commemorates an event or person, but also serves to excite the spiritual life by reminding us of the event it commemorates... The succession of these seasons form the ecclesiastical year, in which the feasts of Our Lord form the ground and framework, the feasts of the Blessed Virgin and the Saints the ornamental tracery." (Catholic Encyclopedia) Note that feast days have been celebrated since the earliest days of the Church, especially on the anniversary of a saint's death. Also note that each saint has a feast, even if it is not celebrated liturgically. Note: For liturgical feast days, try here. For feast days from the Roman Martyrology, try here. For Marian feast days, click here. For liturgical feast days, try here. For feast days from the Roman Martyrology, try here. For Marian feast days, click here. St. Elizabeth Ann Seton was the first American born person to be canonized. St. Francis Xavier Cabrini was the first American (U.S.) citizen to be canonized. St. Martin of Tours was the first non-martyred saint to be honored by the whole Church. "The first martyr to give his life for Christ was St. Stephen the Deacon (Acts vii, 54-9)" (Catholic Dictionary) He is called "Protomartyr". Note: This refers to the period after the death of Christ. The Holy Innocents and John the Baptist are also venerated as martyrs. The first known, solemn canonization was of St. Ulrich in 993 by Pope John XV. Referred to as the "Four Holy Crowned Ones", these martyrs were killed at the beginning of the fourth century, but their names were unknown. Refers to a popular devotion in which fourteen saints are invoked against many troubles and by those of various occupations. Their traditional feast day is August 8. These saints may be invoked individually or collectively. They have been considered to be "especially efficacious" in their assistance. The fourteen holy helpers are: St. George, St. Blaise, St. Erasmus, St. Pantaleon, St. Vitus, St. Christopher, St. Dionysius, St. Cyriacus, St. Achatius, St. Eustace, St. Giles, St. Margaret, St. Catharine, and St. Barbara. Note: The feast of the Fourteen Holy Helpers was suppressed in the wake of the Second Vatican Council of the 1960's. Refers to a highly popular, classic collection of stories of the saints from the middle ages. "Great Saints" include: St. Albert the Great, St. Basil the Great, Pope St. Gregory the Great, and Pope St. Leo the Great. Others sometimes called "the great" include: St. Gertrude the Great and Pope St. Nicholas the Great. Small cards with an image of our Lord, of our Lady, of the saints, or of other holy persons (e.g. Blesseds, Venerables). They may contain a prayer or other information on the reverse side. Catholic prayer cards are often given out at funerals (providing the name and dates of the deceased on the reverse). As indicated above, one is "declared" a saint rather than "made" a saint. The process leading up to this declaration involves various steps (e.g. introduction of the cause, investigation, beatification, etc.). The process may be initiated locally (with the bishop), but the final decision resides with the pope. The "Worship of Hyperdulia" is a technical term referring to the highest degree of veneration allowed to a creature. It is paid to the Blessed Virgin Mary alone. This special homage paid to the Blessed Virgin is not to be confused with the "Worship of Latria" (given to God alone), but is more closely related to the "Worship of Dulia" (and is in fact a higher form of dulia), the veneration due to the angels and saints. Mary, of course, is the greatest creature of all, surpassing all the angels and saints. Since this time, many changes to the canonization process were implemented, leading to an unprecedented number of canonizations. Although the changes have simplified the process and made it less expensive and faster, the changes have led some of the faithful to express a number of concerns over the new procedures (click here for more information), and have even led some to express concern regarding the infallible nature of modern canonizations. Refers to the saints' intercession with God on our behalf, generally in response to prayers. In many cases throughout history, this intercession has been manifested in a miraculous manner. This term is often applied spontaneously - and with very little, or incomplete, knowledge - to persons who are apparently holy. Considering that all living persons are subject to falling (some so-called 'living saints' have fallen quite publicly) and that sometimes appearances are deceptive, the use of this term can be unfitting. Usually is expressed as a person's opinion (and that often ironically considering that the same person might rush to correct another person who expressed a negative opinion that they "shouldn't judge others"). Of course, all saints were once living and one cannot be formally declared a saint until after one's death - and this is reserved to the Pope. Note: In the early Church, all Christians (that is, Catholics), were called "saints". Since then, however, the term has acquired a more limited meaning.